President Donald Trump has made the dubious claim that the noise from industrial wind turbines causes cancer. 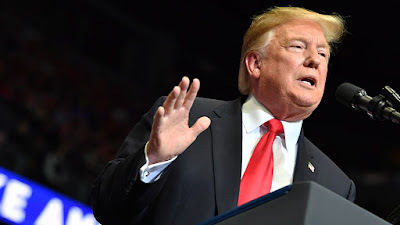 'Hillary wanted to put up wind, wind,' Trump said in wide-ranging remarks at the National Republican Congressional Committee's spring fundraising dinner in Washington DC. 'If you have a windmill anywhere near your house, congratulations your house just went down 75% in value,' Trump continued. 'And they say the noise causes cancer, you tell me,' Trump said, gyrating his arm in the air and imitating a winding noise. There are no studies conclusively linking the noise of industrial wind turbines to cancer. There are, however, scores of claims describing negative health impacts from windmills, particularly from noise. Trump's exaggeration of the health risks from windmills drew opprobrium from his critics online. 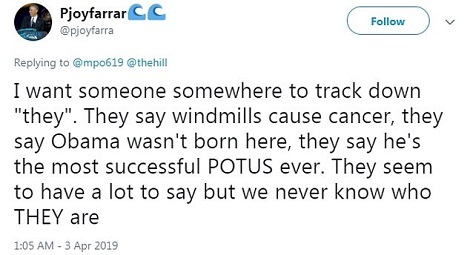 'Yeah I hear the windmill blows the Cancer into you...' one Twitter user wrote.